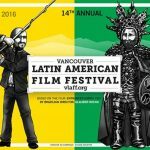 The Vancouver Latin American Film Festival (Brazil, Guest Country), August 25 – September 4, is on its way!! It’s a festival that encourages dialogue among cultures, and explores and celebrates the art of contemporary Latin American and Latin-Canadian filmmaking. VLAFF also showcases the work of several UBC graduate students, and is possible in great part, because of their contributions! There are several ways you can participate and be a part of VLAFF 2016! For complete info, updated scheduling and tickets, please visit www.vlaff.org or our Facebook page. Join us for OPENING NIGHT, Thursday, August 25! We will be screening the acclaimed Mexican film I Promise You Anarchy, followed by the Opening Night Party at The Charles Bar, with music by DJ Millie Wissar (Peru). Party venue: The Charles Bar 136 West Cordova Street (just across the courtyard from the cinema). There will be DJ music, a cash bar and the kitchen will be open for supper. Attend one of our many amazing screenings of films from all over Latin American and Canada. The team at VLAFF has carefully curated a lineup of films that showcases a mix of Latin American auteur cinema and a cinema that is more accessible for all audiences. This year, festival-goers can look forward to 60 films from 14 countries, including 33 feature-length films and 27 short films. Due to high demand for films that discuss activism and current events in Latin America, VLAFF has added a new category to the festival called ¡Activismo!. In addition, the festival screenings have been organized in 7 feature sections, which include a Retrospective of Anna Muylaert’s films, International Hits, New Directors, Short Film Competition, Canada Looks South and Indigenous Film from BC & Beyond, among others. Some of the films we’re screening include: Ixcanul (Guatemala), Ditches (Argentina), Embrace of the Serpent (Colombia), The Pearl Button (Chile), Magallanes (Peru); A Day in Ayotzinapa 43 (Mexico), DNA of Ceviche (Peru), Hopefuls (Brazil), and Don’t Call Me Son (Brazil). Support by attending and sharing with your networks, our program INDIGENOUS FILM FROM BC AND BEYOND, co-presented with imagineNATIVE Film + Media Arts Festival. Introducing to you the shorts that form part of the Canada program, CALLS TO REALITY: (RE)CONSTRUCTING IDENTITIES. *This screening is FREE and open to everyone so please join us for the films and Q&A with attending directors. Saturday, Aug. 27, 5pm, SFU GCA. We are also showcasing participatory films from Brazil. The films are part of an innovative project in Brazil, Vídeo nas Aldeias (Video in the Villages), founded in 1986 with the goal of making film production accessible to Indigenous populations. Friday, Sept. 2 & Sept. 3, 1:30pm, Musuem of Anthropology, UBC; Tickets at the door. GRACIAS!! On behalf of the Latin American Film Festival crew, we hope you enjoy our films and events!